Plastic sheeting has many uses in the home garden. Black plastic prevents weed growth, eliminating the need for hand weeding between your plants. It also helps warm up the soil and keeps it warm. This is vital when growing warm-season plants, such as most vegetables. Both black and clear plastic also preserve soil moisture. Laying plastic over your garden beds is best done before planting or in late winter and early spring when the plants are still dormant. Prepare the bed for laying plastic. Remove any weeds or debris from the garden bed. Till the soil and add any fertilizers or amendments, as applicable. Dig a 3-inch deep trench around the edges of your garden bed. Place the soil that is removed from the trench into a wheelbarrow for use later. Lay the plastic sheeting over the bed. If you have perennial plants in the bed, cut a hole or an X in the plastic that is just large enough to slip over the plants. Smooth the plastic over the top of the ground so it comes in contact with the soil and doesn't float above it. Push the edges of the plastic into the trench. Replace the soil into the trench so that the plastic is anchored down securely. Punch holes between the plants with the tines of a pitchfork. This allows water from rainfall and irrigation to seep under the plastic and into the soil, but the holes are small enough that most weeds will not sprout through them. 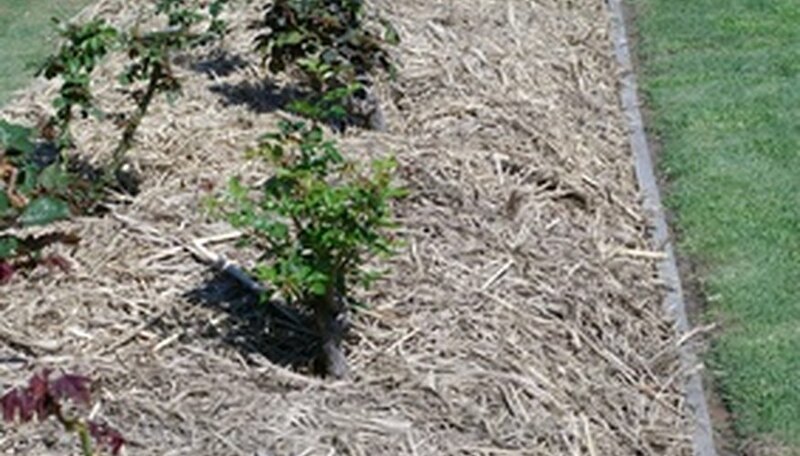 Cover the plastic with an organic mulch such as bark or straw, if desired. Use organic mulch on clear plastic, otherwise the sun shining through the plastic can cause a greenhouse effect and lead to more weed growth. Also use organic mulch in ornamental gardens where plastic is unsightly. Lay a drip irrigation line under the plastic to make watering easy. There is no need to punch holes with a pitchfork if you go this route. Clear plastic can be used to solarize a bed the year before planting. Spread it over a patch of ground during the sunniest, hottest months of the year. The heat built up under the plastic will kill any weeds growing under it, giving you a weed-free bed for planting in spring. In windy areas, anchor the plastic down with rocks as soil may not be heavy enough.